Everyone wants to be like John C. Dvorak (play along.. I'm going somewhere with this). You know why? Because as his catch phrase goes, he gets no spam. Enterto has an email service that claims to be completely spamless. I'll be exploring that claim in this paid review post (Enterto found me through ReviewMe). Enterto spamless email makes use of unique "channels" for every person you interact with. You might consider channels to be aliases that you can delete whenever you want if you start getting spam through there. For example, let's say you want to enter a contest to win a Nintendo Wii (sorry, that's all I think about these days), but the site isn't exactly trustworthy. Just login to your Enterto account and create a new channel. 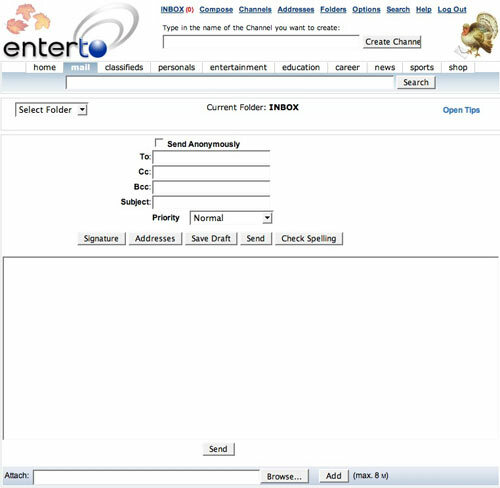 By doing this, Enterto will give you an alias to sign up with, instead of using your real email address. When the contest is over or you just don't want that site to be able to contact you, you can delete the channel. Each free Enterto spamless account comes with unlimited email channels and the ability to "remain 100% anonymous" when you want. When composing an email, you have the option of checking a box to send it anonymously. Unfortunately, it took about one second to peek in the email headers to find my original email address. Even if someone has found your real email address, there is one more hurdle before they can spam you. When sending an email to an Enterto spamless account for the first time, they will receive an automated email asking them to click a link. That creates a channel so that they can continue to interact with you via email. Too much hassle huh? Yeah, I don't like it either. The name - Enterto. I've never heard of them. I'm not going to trust a service I've never heard of - end of story. Ugly!! - Enterto spamless has a horrid Squirrel Mail interface, only slightly modified with a bit of code to create channels. To make matters worse, it is integrated with their (seemingly shady) search engine service. Too hard to use - If it took me that long to explain the concept of "channels" to a tech-savvy crowd, I don't think Enterto spamless will be able to survive with competitors like Gmail, Yahoo! Mail and Apple's .Mac Webmail. Is it spamless though? Only in the absolute broadest interpretation of the word. Requiring users to get so involved with managing channels is just asking for a bad review.